We are both garage door and gate service specialists and can help you when something goes wrong with either system. As a full-service company, we can help you with installation, repair, and maintenance. 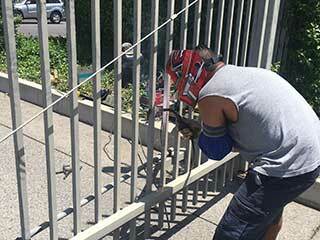 As experienced technicians when it comes to residential gate openers, we can repair all kinds of model. We'll also always check the safety status of your system and the various parts for significant wear and tear. Considering they're located outside all year round, your gate tracks can be particularly susceptible to the elements if not galvanized. Whether your tracks need treatment, realignment or you think it's time for a replacement, our experts are here to help. Your sensors and intercom system are naturally essential for the security of your property. If you wish to upgrade your security system, we'd be happy to run through the options available to you. We can also reprogram your system or troubleshoot any issues you're dealing with. We can also install keypads for any opener type. We can help you to understand how they work and resolve any glitches with the system. If your gate has started to make a lot of noise, or if it seems to have lost its stability, it could be that some of the hardware parts require tightening. During any service appointment, we can make any adjustments as needed. If you have a gate related question or repair need, contact our experts today in Merrick, New York - our technicians have excellent troubleshooting services and experience with all kinds of models. If you're dealing with a stuck gate or an emergency situation, we'll also do our best to get to you as quickly as we can. Give us a call today!